Every year around the end of October, the world gets a little scarier – and a lot more fun! HMNS is no exception to the rule. Join our ghosts and ghouls for a Halloween weekend full of frightful events. Start the weekend off right with Spirits & Skeletons on Friday, Oct.29. Leave the kids at home and attend our totally rad 80’s Halloween party featuring the band Molly and the Ringwalds. Show up in your awesome costumes, dance under the dinosaurs, and be astonished by our master magician. Then head on over to our Real Pirates exhibition or try some creepy crawly insect dishes with our bug chef. 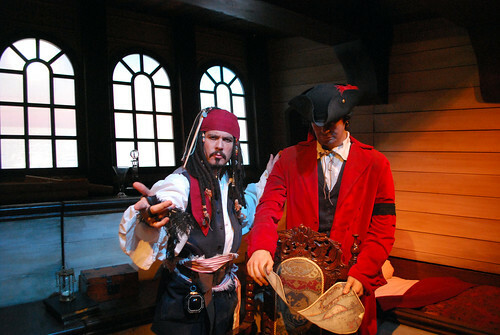 You can also see our Real Pirates exhibition for just $15 during the event! Party like a pirate at Spirits & Skeletons on Oct. 29! On Saturday morning, Oct. 30, bring the kids in their costumes to the only dinosaur bone-yard around! At Tricks, Treats, & T.Rex, our mad scientists will shock everyone with their spine-chilling skills and our creepy scientists will create bizarre concoctions. Discovery the scary side of science, only at HMNS. Then head on over to the George Observatory in Brazos Bend State Park for a special Halloween Challenger Mission. Help out on our space ship as you salvage the abandoned Space Station Observer (lost in 2025) and return it safely to Moonbase 1. Or aid the astronauts from mission control. This event is only available the afternoon of Saturday, Oct. 30 – and advance reservations are required. Call 281-242-3055 for information. Haven’t had enough Halloween yet? On Sunday, Oct. 31, we will be holding Spooktacular at our Sugar Land location. Meet our mad scientists, terrorizing taxidermists, and a mysterious magician who will dazzle everyone with his amazing tricks. To finish off this epic weekend, join us for our Pirate Feast on Sunday evening. Eat, Drink, and Plunder aboard the Elissa, docked at Pier 21 on Galveston Island. Hear tales of the Golden Age of Piracy, and explore the historical and archaeological evidence for many new theories associated with pirates from a culinary perspective. Learn about the evolution of the rum trade, and how food affected the sea routes of pirates. The Texas Seaport Museum will also be open for this event. My wife, daughter and I had a great time at Spirits and Skeletons. We have been going for 3 years now and look forward to it every year. anyone have any pictures of the event/costumes? Hi Larry! So glad to hear that your family enjoyed Spirits & Skeletons! We’ve asked people to share their photos on our Facebook page and Flickr pool – hope you’ll share some of yours, too!